Officers are training with a leading equality charity to increase the reporting of hate crimes. Network: Liaison officers will work in tandem with police. 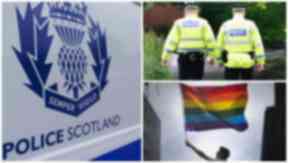 Police Scotland has set up a network of LGBTI liaison officers in a bid to improve the reporting of hate crimes. As crimes based on disability, sexuality, race or religion often go unreported, senior officers have moved to promote the use of third-party reporting through a list of charities and community groups. Chief constable Phil Gormley said tackling intolerance and prejudice is an "absolute priority" for Police Scotland, with around 90 officers training with the Equality Network, Scotland's national lesbian, gay, bisexual, transgender and intersex (LGBTI) equality charity, to help prevent such crimes. Mr Gormley said: "Every incident has a significant impact on the victim, their family and wider communities. 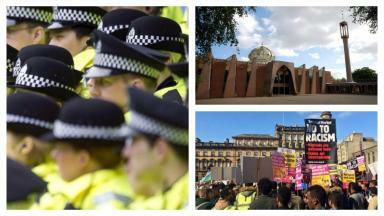 "I am asking the people of Scotland to continue to work with us to ensure every incident is reported to the police. "We recognise that hate crime often goes unreported and there are many reasons why people don't come forward and raise their concerns, but we must work together to ensure hate crime has no place in our communities. "Hate crime can manifest itself in lots of different ways, for example offensive graffiti, having your property vandalised, having your belongings stolen, people swearing or making abusive remarks making you feel intimidated or harassed, through online abuse, being threatened or being physically attacked. "All of this behaviour is completely unacceptable and, whether criminal or not, Police Scotland wants to know about it in order to avoid behaviour escalating and being unchallenged." Equality Network director Tim Hopkins hailed the collaboration with Police Scotland as a positive step in the battle against hate crime. He said: "We were happy to provide training on LGBTI hate crime issues to nearly 100 police officers across Scotland earlier this year and it's great to see that Police Scotland have now set up a national network of liaison officers. "This will help LGBTI people have the confidence to report hate incidents to the police and will mean that there should always be a police officer they can make contact with who has an understanding of LGBTI issues."